Ronnie O’Sullivan has been knocked out of the World Championship, beaten 13-10 by China’s Ding Junhui in the quarter-finals. Ding built a 10-6 lead after two sessions but O’Sullivan scored a 97 and a magnificent 146 to win three of the first four frames on Wednesday. Five-time champion Ronnie O’Sullivan, tried to claw back the deficit with some courageous snooker, but ultimately his revival was left short, with a strong and convincing performance by Ding Junhui. And Ding finished off with a classy 117. 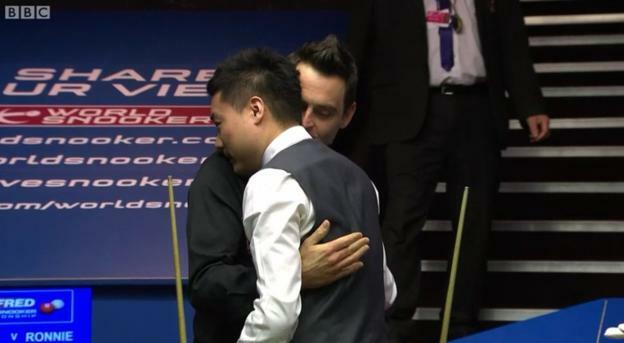 He now meets Mark Selby in the last four. Facing the world champion will be a bigger hurdle mentally and we cannot say how it will pan out.